....Maybe it's Time To Try WRS! 40 Years of Helping your business do more business! WRS Members may participate in any or all of our meetings at anytime. You can expect to leave having met, connected and established a rapport with many new contacts! 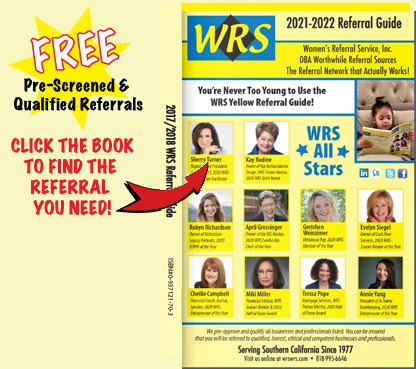 At WRS, I have met hundreds of terrific business people who gather to share business referrals, tips, and friendship. I made connections, grew my business, changed businesses, became an author, and developed life-long friendships because of this wonderful organization. I’ve been coming to meetings every month now for 31 years. And I ain’t quitting! WRS has played a pivotal role in the success of my company. I have been a member of WRS for 18 years. I aspire to the same values and principles on which WRS is based: treat others with respect and integrity; you ultimately help yourself by helping others first; and no hard sales approaches. WRS has given me the support and confidence to grow my business. After one year with WRS; I doubled my business and received a special acknowledgement from my company. WRS has given me the opportunity to consistently share my business and meet other respectful & caring business owners. Because of the quality of the WRS membership, I feel confident whenever I refer one of them to a friend. WRS has been my go-to community for professional networking for many years and has been a very satisfying experience: wonderful referrals, new business coming my way, and dear friends and colleagues gained. WRS has connected me to so many of my best customers over the years. I can't imagine what my business would be like without them in my corner. I get 85% of my business because of WRS. WRS Members are Honest, Honorable and have High Integrity. It is a blessing to do business in an organization where integrity prevails. Ready to move your business to the next level? Contact us for details on Branding and Marketing Packages and Programs. Program 1 – We do it all for you! Create, manage and implement one time or ongoing strategic marketing campaigns. Create marketing and advertising materials from concept through design and delivery. Hire and train new or existing sales force. Database marketing creation, management and implementation. Strategies to market your business on the internet. We help you do it… RIGHT! Phone coaching with Nancy Sardella, WRS Sr. Marketing Consultant, who will ensure your marketing strategies are right for you and your business and produce results. This program was designed specifically for entrepreneurs who want the benefit of marketing expertise, guidance & coaching but who want to implement their marketing programs themselves. This program also includes ongoing review of your marketing plan and marketing materials to ensure they are effective. Coaching / consulting time can be used for any marketing you feel you are not qualified to do or simply are not inclined to do. We pre-screen and qualify all businesses and professionals. ethical and competent businesses and professionals.